We know it seems early to start talking about fall — it’s not even Labor Day yet, people! — but fall colors in the West are kind of like a fireworks display: Boom, everything is yellow and red and orange (but mostly yellow — thanks, aspens!) then it’s gone in a flash — especially if any of Colorado’s notoriously quick-to-change weather blows in and blows all the leaves off the trees. Because of the elevation and climate, Colorado’s fall foliage comes a bit earlier than other parts of the country, so you may want to start planning your color-watching trip now. Mid-September to mid-October is usually the best time to see Colorado’s colors, and late September is always a safe bet. There’s no better spot to take in the colors than the San Juan Mountains in southwest Colorado. The San Juan Skyway starts (and ends) in Durango and forms a 233-mile loop through the San Juan Mountains, taking travelers through the Victorian mining towns of Silverton and Ouray and the mining-town-turned-ski-resort of Telluride. The 117-mile Silver Thread Scenic Byway stretches the length of Highway 149 — which picks up off Highway 160 about 100 miles east of Durango — and winds through four counties and three towns including Lake City, Creede and South Fork. US 160 between Pagosa Springs (60 miles east of Durango) and Cortez (45 miles west of Durango). US 50 west from Gunnison to Colorado 149 south to Lake City and Slumgullion Pass. Colorado 550 from Ridgway (about 80 miles north of Durango) south through Ouray and Silverton to Durango. Colorado 135 between Crested Butte and Gunnison (170 miles north of Durango). Durango & Silverton train + fall colors = Purty. But the worst part about driving to catch fall colors is that someone has to pay attention to the road, so whoever’s behind the wheel will miss out on some of the views. The Durango & Silverton Narrow Gauge Railroad is offering its 24th annual Fall Photo Experience Sept. 28 and 29. Unlike normal passenger trains, photographers (pros and hobbyists alike) will be able to deboard to get photos of the train steaming through a vibrant backdrop of fall foliage. Passengers are dropped off, then the train backs up and chugs past the line of photographers. Don’t worry: The train stops and lets everyone back on. 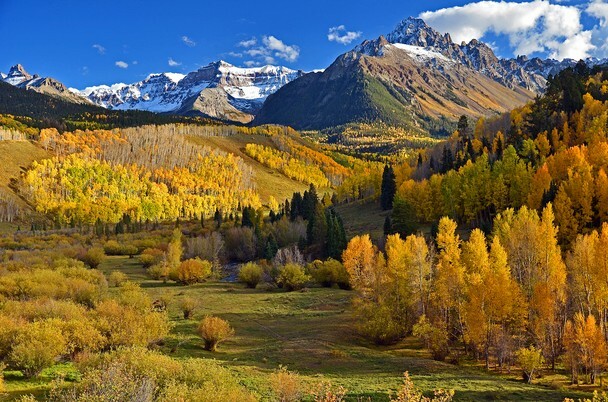 As you may have gathered, Durango is a perfect hub for any fall color-watching trips you plan to take in the San Juan Mountains — whether by car or by train — so be sure to book your room at the Durango Quality Inn today! Pingback: Hooray for Ridgway and Ouray, Colorado - Food, travel, music: A Table For One, Please!